One of the most effective and powerful methods to promote your web site is with articles or what some call “Article Marketing”. What articles have to do with promoting your site you might ask, well, a lot! First, the Internet is providing a major thing to the web surfers and that is information or in other words content, you probably heard people say often that in the Internet marketing arena “content is king”. Every web site owner need some content for his site, this content might be text, articles, audio info , video clips, Images, news feeds, graphs & charts etc’. Google could be illustrated as a teacher standing in front of a class and asking a question (a surfer is making a search in Google), in front of our teacher seating millions of students all crying out load: “ I know the answer pick me! “ (the web sites trying to be first in the SERPs (Search Engine Results Pages). How our teacher is supposed to decide who of all those millions of sites might have a cleaver, concise or the right answer? Google needs some criterions to determine the quality of these web sites. Google is using Page-Rank ( PR ) to determine the quality level of web sites. It is known that one of the major factors they weight most heavily is the amount of other web sites pointing or linking to your site or “voting “ on your site. Ok, so now you understand you need many other web sites to point and link to your site in order for your site to receive as higher PR as possible. How would you cause or convince other site owners to place a link to your Site? Actually there are many ways to do just that, Reciprocal linking directories, these directory sites serve as intermediates between web sites owners. Sending emails to other sites webmasters, buying links from high PR sites, leaving comments at blogs with your signature, providing testimonials about products, books and services and at the end leave your back link to your site etc’. How to get links to your sites is an article subject deserves its own article and is beyond the scope of this article, here we focus on Article Marketing. What is wrong about reciprocal linking? Noting is wrong with it, the thing is the search engines are counting all the incoming links and comparing them to the number of the outbound links, the more links you have that are linking to you the higher The PR would be. Google is looking for natural linking if they see many reciprocal links they understand it’s an arrangement linking and not natural linking. As you might imagine reciprocal linking is time consuming and I personally don’t have the time to peruse it. The best method to get one-way links to your web site is by article marketing. In every article you write at the end you should add something called resource box, in it you write your name few words about yourself and a back-link to your site! Yes this is the most important part in your article. The back-link should be in the form of anchor text link, this is a text that describes your main theme of your site, underneath it “hides” the hyper link to your site. Let’s say your site is about Credit Cards, then it is recommended you back link to your site by using the text: Credit Cards and not merely by using the straight forward URL address of your site. It’s most important because this way the search engines associate your site with the theme of your site, that is because if many sites are linking to you using the anchor text: “Credit Cards” then the SE will determine not only that your site is important but that your site is important site in the field of Credit Cards! It’s recommended to create few anchor texts keywords so you will gain credibility in more than a single keyword. link it would be in blue color text. - Mark it and right click on it with your mouse. - A menu will pop up, one of the options there will be” Edit hyper link”. - Type there your site’s main theme text (Credit Cards). site’s URL address will appear, click ok at the bottom and you are done. - Copy and paste the anchor text link to your Article resource box. I usually build my web site with one article of about 1,200 words, divided into three sections of about 400 words each. Why 400 words? because with 400 words you can cover in-depth subject. I will explain why I divide it into three sub articles later on. After you have written an article and arranged the resource box, now you are ready to submit your article to article directories, there are many article directory sites and few with high PR article directories sites. In each of these sites you will find Thousands of articles in hundreds of categories and sub categories. Why all these authors submit their articles for free to the Article Directories sites? you guessed it, they all need back-links to their sites. On the other side of this coin there are the web site builders that have no time or talent or both and they need badly content to their sites, what do they do, yes, you guessed it right once again, they come to the article directories sites and pick a good article/s to put onto their sites for free, all this, as long as they keep the author’s resource box with a live hyper link to the author’s site. Once your article is put into many article directories it starts to develop a life of its own. Web site owners paste it on their site pages, Ezine publishers might grab it to their electronic magazine, online as well as offline publishers and editors who are always on the look out for good content and interesting info might use your article for their needs. Bloggers can put it on their blogs and by that enables your article to be syndicated via RSS feeds all across the web. The wide spread distribution of your article can bring some traffic to your site on its own merits and might even serve at time as alternative to SE traffic. All this creates a snow ball effect that can build your site’s PR and establish you as an expert in your field. This whole process takes some time and it’s gradual and that’s the beauty of it, SE perceives it as natural growth and rewards you accordingly. This process is intensified as time passes by and new sites continue their marketing efforts and gaining higher PR and by that strengthening your site because now higher PR sites are pointing at it. Important point I would like to make here though, SE notice in few months time that the content that is pointing at your site is a duplicate content and this fact weakens the effect but as long as you keep producing new high quality articles and repeat the process your site will rise in PR and continue to raise in the ladder to the top SERPs of the Search Engines. In addition it is recommended to make few headers to your article in order to improve the chance to be published in various medias and to lesser the duplicate content effect. This is why I mentioned earlier that it’s wise to build your article in a structured way of three parts, each of about 400 words, in some cases each part can cover different aspects of the subject at hand and be divided into three different Articles. The best tactic is to make it in phases, send an article to the article directories every three or four weeks, don’t send it to all directories at once and not all your articles at once, keep your ammunition for the months ahead. Article distribution is time consuming as well. There are two solutions to it, there are some software products that you pre-set and upload your articles and the software will automatically distribute them to your article directories of choice. The second solution that in my mind is the preferable one is a web service that will distribute automatically your articles to not only the article directories but to thousands of publishers and editors as well as writing groups on the net and by that give you a better coverage and in addition it’s much quicker. I usually start with up to six of the leading Article directories and then go to the automatic distribution service on the net which is free for a certain amount of distribution level. You can reach it through my web site. 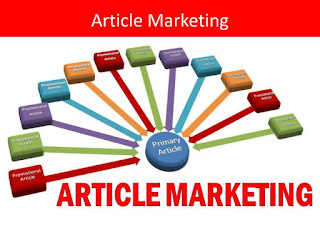 Article marketing is the most power full method I know to make Search Engine notice your site and spider it, then increase the amount of back links to your site automatically and naturally and makes the SE index all your pages and provide you high PR and good placements at the SREPs. Use this knowledge wisely and prosper.